The Lobed Brain Coral has everything going for it... very attractive, very hardy, and very reasonably priced! The popular and durable Lobed Brain Coral Lobophyllia hemprichii is a favorite beginner's large polyp stony (LPS) coral. It is distinct from other Lobophyllia species because of its colorful variations and textures. Colors vary from bright red, orange, blue, green, gray, white, tan, or brown and can be a single color or have a contrasting center. 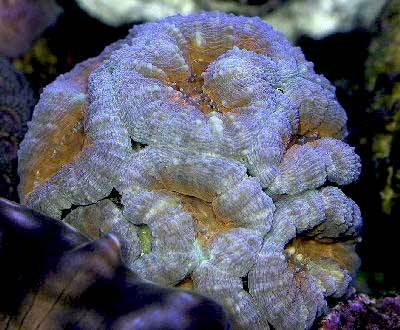 Their large polyps are thick and fleshy with either a smooth or rough surface. Each polyp forms curves, almost like an hour glass shape, but often with a few more curves and an open center. The Lobophyllia species form massive colonies in the wild, often more than 15 feet (4.5 m) across. A giant colony of L. hemprichii is very impressive. Although this coral is semi-aggressive towards other corals, its colonies are often groupings of multiple individual colonies of this same species. Each individual group will have its own distinct coloration and texture, making a tapestry of color and design. Lobophyllia colonies are either flat or domed. Typical of many brain corals, the Lobophyllia grows in two basic shapes. They can develop as flabello-meandroid forms, which means there are elongated meandering valleys between separate corallite walls; or they can be placeloid, which means tall separate corallites rising up from the skeleton that are very predominant. They can have polyps on the ends of branches, and these can be very long branches up to 12' (30 cm") in length. Their large prominent polyp tissue usually cloaks the underlying skeleton from view. The Lobed Brain Coral is one of the easiest of the LPS (large polyp stony) corals to care for, and it easy to propagate. Use moderate lighting and moderate water flow that is turbulent. Since they are found in several lighting environments, watch your coral to see how it responds in your tank and adjust the light accordingly. You can do this by placing the coral higher or lower in the tank. It is best to start at the lowest point and work up. L. hemprichii has been propagated in captivity with great success. Some of the common names they known for are Lobed Brain Coral, Flat Brain Coral, Wrinkle Coral, Open Brain Coral, and Meat Coral. This genus of corals can be confused with Symphyllia species, however they can be distinguished by the skeletal structure. Symphyllia corals have corallite walls that are joined or fused together rather than separate. They can also be confused with the Scolymia genus when young or just a single polyp, this is just until they develop their curved hourglass shaped polyps. The Lobophyllia has such a wide variety of habitats, that placement in your tank is important. While some are found in shallower waters, others can be found quite deep. What's an aquarist to do? Place them low in the tank and watch how they react. They may need more or less light but typically they can be brought up to moderate light and moderate water flow. TIP: Feed your fish first so they do not steal food from your Lobo. Lobophyllia hemprichii have a much more textured surface than others in this genus. They take on an almost alien shape at night! Watch this video and enjoy the dramatic music as the coral goes from "donut" shape to wanting to EAT a donut shape! Moderate flow and light is needed, yet slow acclimation to the lighting you have is suggested. Distribution / Background Lobophyllia Coral Information: The Lobophyllia genus was described by Blainville in 1830. There are 22 nominal species, 7 of which are true species with 5 being found around Australia. Besides L. hemprichii, the valid species are L. corymbosa, L. costata, L. diminuta, L. hataii, L. pachysepta, and L. robusta. The Lobophyllia genus has been propagated in captivity. The L. hemprichii was described by Ehrenberg in 1834. Some common names these corals are know for are Lobed Brain Coral, Flat Brain Coral, Open Brain Coral, Wrinkle Coral, Meat Coral, Modern Coral, Large Flower Coral, Carpet Brain Coral, and Brain Root Coral. The L. hemprichii has been propagated in captivity with great success. Where Lobophyllia Corals Are Found: The Lobophyllia genus are found in the Indo-Pacific and western Central Pacific; in the Philippines and Indonesia, from Japan to Australia, and Mozambique to the Mariana Trench. Lobophyllia hemprichii are found from eastern Africa and the Red Sea to Tahiti and the Tuamotu Archiplego; also around Australia in the Great Barrier Reef, the Coral Sea and Flinders Reef, and south to the Houtman Abrolhos Islands. Lobophyllia Coral Habitat: The Lobophyllia genus are found in many types of environments, but are most common on upper reef slopes and fore reef slopes. Though colonies are usually in fairly protected areas, they are found in both shaded and brightly lit waters and in both vertical and horizontal orientations. They are found at depths from 10 - 115 feet (3 - 35 m) in various types of water movement. Lobophyllia form massive colonies that can reach over 15 feet (4.5 m) in diameter. They feed at night, extending whitish tipped tentacles. They can be long-lived in captivity, but their actual life span is unknown. Status The following species from the Lobophyllia genus are on the IUCN Red List of Endangered Species. Description What do Lobophyllia Corals look like: The Lobophyllia genus can grow in different colony formations. The colonies can be a branched formation where the corallite (main polyp) walls are tall and separate from the others, coming up from the skeleton of the colony like a single branch. The other formation is when the colony has corallites with long winding valleys, but each corallite or polyp has its own separate walls. The colony is generally flat with the polyps tops being in the same plane. Two main features of Lobophyllia corals are that the corallites or polyp's walls are not shared with other polyps; and each polyp forms curves, almost like an hour glass shape with a few more curves, without closing in the center. This genus of corals can be confused with Symphyllia species. However the Symphyllia corals can be distinguished by the skeletal structure, they have corallite walls that are joined or fused together rather than separate. Single polyps of the Lobophyllia genus can be confused with the Scolymia genus when young. This is because at that stage it does not have the polycentric (hourglass) shape, but as it grows the shape becomes apparent. Their large polyps are thick and fleshy with either a smooth or rough surface. Colors can be dark red, green, olive, brown and gray, and can be a combination or monochromatic. Some have contrasting oral disc tissue in blue, white, gray, orange, red and green. At night the Lobophyllia genus extends feeder tentacles. L. hemprichii or the Flat Lobed Brain Coral forms one of the largest colonies. The polyps can reach 2" (5 cm) and are at the ends of 12" (30 cm) long branches. You cannot usually see the branches since they are hidden by the collection of polyps of the colony. This is the most colorful species. Colors vary from bright red, orange, blue, green, gray, white, tan, or brown and can be a single color or have a contrasting center. The feeding tentacles, which come out at night, are usually tipped in white. Some colonies of Lobophyllia can reach 15 feet (4.5 m). These coral can be long-lived in captivity, but their life span is unknown. Difficulty of Care Lobophyllia Coral Care: Like other Mussids, the L. hemprichii is easy to care for, making them an excellent choice for the beginner. Use moderate lighting and moderate water flow that is turbulent. Since they are found in several lighting environments, watch your coral to see how it responds in your tank and adjust the light accordingly, by placing higher or lower in the tank. It is best to start at the lowest point and work up. Like other members of the Mussidae family, the polyps tentacles come out at night to feed. Foods / Feeding Lobophyllia Coral Feeding: The Lobophyllia genus, like other large polyp stony (LPS) corals, have developed several feeding strategies. Through a symbiotic relationship with a marine algae, known as zooxanthellae, they receive some of their nutrients. They also capture planktonic organisms, food particles from the water column, and can absorb dissolved organic matter. In captivity, L. hemprichii does well being be fed minced pieces of fish and shrimp flesh as well as mysis, rotifers, newly hatched brine shrimp or Cyclopeeze. Feed once a week or depending on how much the coral is accepting food. Feed at night when tentacles are present, although the tentacles can be seen during the day at times and they may accept food then. The following water supplements are suggested for Lobophyllia species: Trace elements and iodine may also be added. Aquarium Parameters A well-feed live rock/reef environment is what is needed for your Lobophyllia Coral, along with some fish for organic matter production, and dissolved organics. A mature tank is recommended. Be sure to have proper water movement and lighting. Provide a low to moderate and turbulent water flow and moderate to high lighting for the best health. Fast laminar (one directional) water flow can cause tearing. This is an aggressive species, extending their sweeper tentacles at night. There needs to be plenty of space between it and other corals. Compatibility and Social Behaviors The Lobophyllia genus is aggressive towards other corals. The L. hemprichii is aggressive yet they tolerate their own species.This coral needs to be kept away from other corals due to their aggressive nature. They can sting others with their long sweeper tentacles so must be placed far enough away to avoid damaging other sessile animals. The Lobophyllia genus are hermaphrodites that use external fertilization in the wild, Budding has also been observed. In captivity propagation is done with severing. Start with a healthy and well adjusted animal. Use a dremel, electric saw or saw to make a clean cut. Cut through the middle of the coral to make 2 halves or 4 quarters. Put the newly cut frag in clean water with turbulent water flow and moderate light to help it heal. Potential Problems The L. hemprichii are attractive and durable when their needs are provided for. One directional water flow can cause tissue recession. Tissue is subject to tearing if not handled appropriately. When removing from water, gentle shake the coral until most of the tissue has retracted, or it can be torn from its own weight when removed. Availability Lobophyllia Corals for Sale: The L. hemprichii is very easy to find at pet shops and on line. The cost for online stores is around $30.00 to $80.00 USD per polyp depending on size and color.